To reduce your cost, Brandsport offers this item in Bulk (sold here individually). Gorilla also lists this same item in 4-piece sets as Display Package # 30037 and Bag # 30037B. The zinc plated finish will resist rust and corrosion so the driving experience lasts for years without worry. 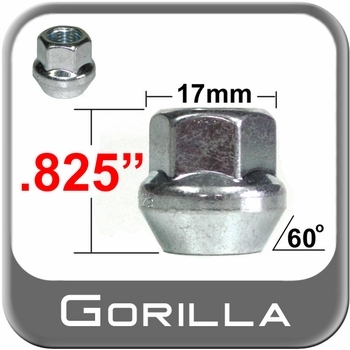 These Gorilla 12mm lug nuts come from tempered steel processed using the highest standards. Long lasting durability with enhanced seating surface to meet any wheel specifications.